Seventy-eight years ago on this day, the German national team celebrated the first of its two greatest days of all-time at the Winter Olympics. The world-wide economic depression had reduced the ice hockey competition at the Lake Placid Games in 1932 to a field of just four teams. Thus, all but one squad were sure to receive an Olympic medal. In spite of all this, the Germans had arrived in upstate New York with legitimate aspirations, anyway, after having won both the silver medal for the World Championships as well as the European title at the 1930 tournament that was started in Chamonix, France, but moved to Berlin as a result of bad weather. Only two changes had been made to German Aussenkapitan (player-coach) ERICH ROEMER’s team from the 1930 champion squad — the two new players being forwards WERNER KORFF of Schlittschuhclub Berlin and Sportclub Riessersee’s GEORG STROBL. Germany got its 1932 Winter Games off to the right start with a critical 2-1 defeat of Poland thru a pair of Blitztore (lightning goals) from GUSTAV JAENECKE and MARTIN SCHROETTLE. Jaenecke, a 23-year-old left wing from Schlittschuhclub Berlin, scored nine goals in six games at the 1930 World Championships and entered the Lake Placid tournament Germany’s all-time leading goal-scorer at major international events with 16 goals in 14 games. As expected, the Germans lost all four contests against the North American continent’s teams. The first of those, a 4-1 defeat at the hands of Canada, was respectable; the pair of losses the silver medalist United States by the combined count of 15-0 was rather disappointing. Nonetheless, one final match with Poland still provided opportunity for the Olympic bronze medal at the III Winter Games for the black-sweatered German sqaud. The Poles were not prepared to go quietly but, following a scoreless first period, 21-year-old RUDI BALL sent the Germans in front. 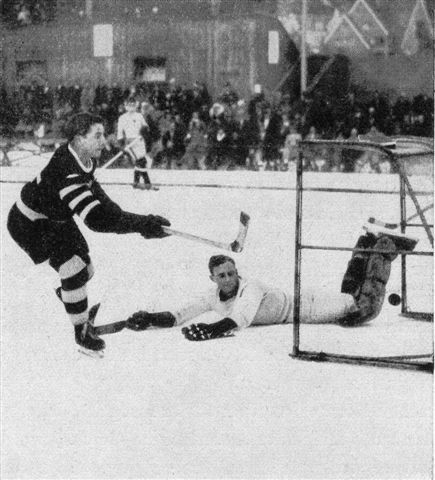 Poland pulled level two minutes into the third period of play but 120 seconds later Ball, the 5’4″ 140-pound linemate of Jaenecke for both club and country, put Germany back in front. The rookie Strobl shot a third goal for the Fatherland while Ball then bagged his third goal of the game to set the final score at 4-1 for Germany. For Rudi Ball, who scored one goal in five games for Germany at the 1930 World Championships, it is the break-out match of his distinguished international career. It also marked the very first time a German player performed the ‘hat trick’ at the Winter Olympics. Ball also added two assists at the 1932 Lake Placid Games and was, therefore, involved in five of Germany’s seven total goals at the tournament. The bronze medal in 1932 would represent the finest German hour at the Winter Olympics for the better part of the next half century. All-time German great GUSTAV JAENECKE stickhandling here for powerhouse German outfit Schlittschuhclub Berlin. 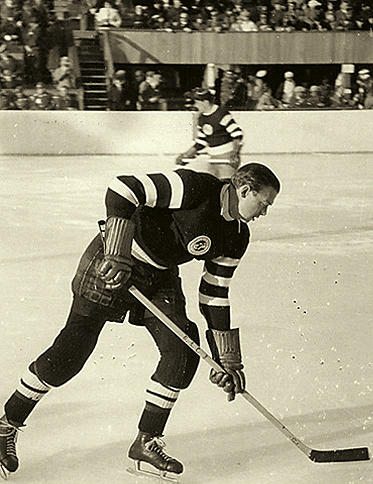 Jaenecke first skated with the national team as an 18-year-old in 1927 and finished in 1939 after scoring 43 goals (82 games) for Germany in all competitions. A powerful left wing, Jaenecke also spent time on defense in the latter years of his career. The national team of GERMANY has a long a proud tradition in international ice hockey competition dating back to the time of Kaiser Wilhelm II. The Germans appeared at all five European Championships from 1910 thru 1914, the very first major ice hockey events for national teams, prior to the outbreak of the First World War. Although Bohemia won three of the four European Championships they contested, Germany finished second four times and third on the other occasion to establish themselves a legitimate power on the continent. The aftermath of the Woodrow Wilson’s “war to end all wars” and the Treaty of Versailles included Germany’s exclusion from international competition. This, of course, extended to the Olympics, which resulted in no German participation at either the Antwerp Games of 1920 or the first-ever Winter Games at Chamonix, France, in 1924. Germany were first allowed to re-enter a major ice hockey tournament again at the 1927 European Championships held in neighboring Austria. The host nation won that tournament but Germany did finish a respectable third (out of six) and unveiled a pair of would-be steady performers for the years to come in the Schlittschuhclub Berlin pair of defenseman ERICH ROEMER and forward GUSTAV JAENECKE. While disappointment lay in wait at both the 1928 Winter Olympics and the 1929 European Championships, Germany would have their opportunity to sit in the sun shortly. This, in large part, was due to the arrival of the small but skillful RUDI BALL, another Schlittschuhclub Berlin skater who was Jaenecke’s new linemate with both club and country. Bolstered by ten goals from the fresh forward combination (Jaenecke scored nine goals while Ball added four assists) and backed by another three goals from their clubmate on the blueline, the Aussenkapitan (player-coach) Roemer, the Germans reached new heights at the first-ever non-Olympic year World Championships staged in 1930. Germany defeated all four of its continental opponents to claim the European title also on offer and, despite the 6-1 loss to Canada, earned the very first set of silver medals ever presented by the International Ice Hockey Federation. To this very day, eighty years later, this is still the highest finish for Germany at a major international ice hockey tournament. Germany did not send a team to the World Championships the following year but did send a contingent across the Atlantic Ocean in 1932 to contest the III Winter Olympic Games in the United States. Because of the Great Depression only four nations fielded teams at Lake Placid. Small field notwithstanding and paced by three goals from Ball in the final match against Poland, the Germans still secured a satisfying set of Olympic bronze medals in upstate New York. Later that spring, Germany lost just one match out of four at the 1932 European Championships, the last such independent tournament, on home soil in Berlin but still finished fourth and out of the medals. Although the defense allowed just three goals, the offense could only generate that many goals itself. A last period goal conceded in the 1-0 final game loss to Sweden doomed the Germans. Germany finished in a tie for both third place in the European standings as well as fifth place in the overall standings at the 1933 World Championships in Prague. WALTER LEINWEBER, the EV Fussen giant who had been ever-present in Germany’s goal since 1929, was replaced for the tournment by Sportclub Riessersee netminder WILHELM EGGINGER but the German defense remained reasonably strong nonetheless. Ball stood out once again with six goals in six games and netted the lone German goal in the match for third place in Europe, the 1-1 draw with the neighbors and rivals, Switzerland. The Germans enjoyed another highly-successful skate at the World Championships the next year in Milan. Although still not able to defeat the North Americans, Germany did rally to knot the third-place match with but five seconds remaining versus Switzerland on a long-range desperation shot from the aging Aussenkapitan and defensman Roemer. HANS LANG of Sportclub Riessersee later scored in the second overtime to give the Germans a 2-1 victory and a second European title in five years. By this point in history, however, the evil forces of Adolf Hilter and his Nazi minions were already well at work in Germany. There was one conspicuous absence from the German national team at the 1934 World Championships contested in Italy. Although just 23 at the time of the tournament and already a proven veteran of international competition — Rudi Ball was not in German uniform.